It’s a natural disaster without an icon. A year after the BP / DeepWater Horizon disaster that pumped oil into the Gulf of Mexico, and there is no single image of the disaster that sums up its ecological impact, and makes our green blood boil. 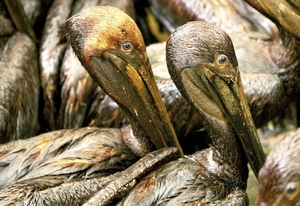 Think about it: can you remember an iconic image of an oil-soaked seal, a big-billed pelican struggling to free its tarred feathers from the brown waves, a sea otter choking on black gold? Animals did die a plenty, and plenty of pictures of tarred wildlife were captured by photographers documenting the spill. But no one species bore the brunt, and by dying in its thousands acted as a sentinel to the spill's destructive power. No oiled humpback whale washed up ashore to galvanise and focus the eco outrage. But on the anniversary of the largest oil spill in US history we are reminded of an important fact: just because there is no iconic victim of the spill, it doesn’t mean iconic animals weren’t seriously impacted. Much of the ecological impact has so far been hidden, according to a BBC report today, partly because the spill happened out to sea, and oil was spilt directly onto the sea floor. But as time passes, scientists are slowly getting a better view of how much wildlife was affected. In February, the BBC reported how video taken by US Navy deep sea submersible ALVIN is showing that the sea bottom around the site of the spill is littered with dead and dying sea fauna - generally invertebrate worms, corals and sea fans. Yesterday, the BBC also reported how fishermen in Louisiana call the spill “The Monster under the Water” due to the impact it is having on their catch. But when it comes to more iconic species, a newly published study by an international team of experts is as worrying. According to this research, the tally of dead cetaceans (whales, dolphins and porpoises) across the northern Gulf of Mexico, which have been linked to the spill, has only just passed 100. But it’s the dead whales we don’t see that matter more than those we do. The icons that are not, because they died quietly, out in the open ocean, where their bodies would be nibbled away to nothing or be left to fall silently to the sea floor, out of sight and out of mind. In the study, the marine scientists estimated how often we come across cetacean carcasses in the Gulf of Mexico for 14 different species, including sperm whales, beaked whales, pilot whales, orcas and other dolphins. They specifically chose species for which we also know their abundance, survival rates and have stranding records. That allowed the team to calculate the probability that we would even notice a whale or dolphin that had died at sea. Their preliminary analysis makes stark reading, for those who fear the spill was an environmental catastrophe, and for those that believe it wasn’t. 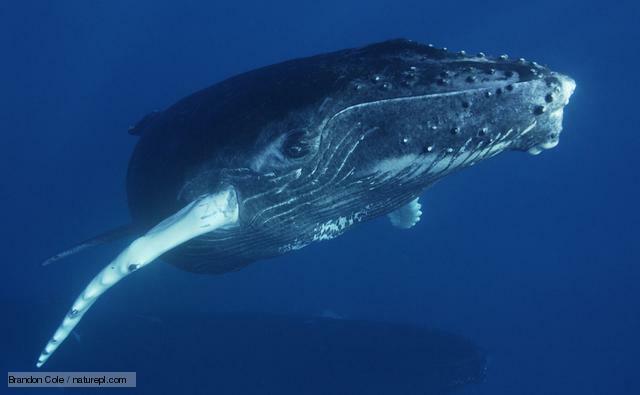 Carcasses are recovered from, on average, 2% of cetaceans that die at sea, the scientists find. That means 50 times more whales, dolphins and porpoises may have been killed by the BP / DeepWater Horizon spill than currently assumed. Or to make it real, the spill may have killed 5000 of these iconic animals. To date. There are caveats to this estimate, which the researchers spell out in their paper published in Conservation Letters. For example, it would be hugely helpful if any whales killed did wash ashore, so autopsies could establish if the deaths were due to oiling, or other factors, including natural causes. A lot of effort was spent by US government agencies searching for dead marine mammals after the spill; that may mean more than the usual 2% of cetacean bodies were recovered after this spill. However, other evidence suggests that the carcass recovery rate of 2% is itself high. This is partly because carcasses of some species, such as Cuvier’s beak whales and melon-headed whales, turn up relatively often. But because the deep diving animals are so elusive, scientists acknowledge they make extremely conservative estimates of their abundance. That means the carcass recovery rate for these species is likely to be inflated, which inflates the overall figure. Some species naturally fall prey to others (such as orca) so you wouldn’t expect the bodies of oiled whales necessarily to survive long anyway, again suggesting dead whales often disappear before they can be counted. Finally, cetaceans are social, meaning pods or schools of the mammals may have been killed, and disappeared, en masse. These reasons suggest that the number of cetaceans killed in the Gulf of Mexico is more than 50x the number so far recovered, not less. The researchers present their results as the starting point for the discussion. But it’s a discussion that needs to be had: was a natural disaster without an icon a disaster for iconic species? Important science wrapped in drivel. It could have done with a higher profile and more facts to help keep the Deepwater Horizon properly in the news. Basically human beings are screwing up the earth and in the end we will be left with nothing because we will have canibalised the land, the sea, all the natural resources there are and then we are stuffed. The world would be a much nicer place without people. If there's gonna be deep water drilling, there's bound to be accidents. A fairly pointless article followed by one spectacularly pointless comment 'the world would be a much nicer place without people'. Just who exactly would be around to appreciate that fact? Also we can't canibalise the land as we're not land. This is an interesting thought piece and time will tell. If you've read most of the "drivel" which has been reported for the anniversary, you'd think nothing had happened and that life had got back to normal. Watch this space and wait for the real impact to unfold. A great thought piece Matty W.
Mark, I'm passionate about conservation. But wild guesses - to back up preformulated opinions - do not serve the cause.